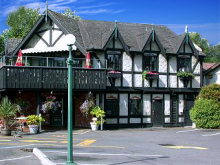 Cozy British Style tavern with a 2nd floor deck offering global comfort fare and many draft beers. Smugglers Cove Pub offers visitors a taste of the local life in Victoria. With many imported and local ales on tap this pub has a loyal local following where visitors can enjoy a cozy, friendly atmosphere. We are located in Cadboro Bay at 2581 Penrhyn St. Check the map below to find Smugglers Cove Pub and Liquor Store location in Victoria BC. Take the Google Virtual Tour!